Taking a stand in the Foodservice Australia show is a great way to meet your customers, demonstrate products and generate new business. 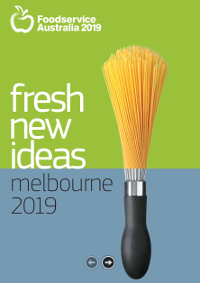 The next show is running from 23-25 June 2019 at the Melbourne Convention & Exhibition Centre. This magnificent venue is located only a short distance from the city centre with easy access for exhibitors and visitors. We have stands available to suit every product and budget, with sizes from 6m2 to 90m2. To make exhibiting easier we have included more in every package including free carpet on space only stands and a free powerpoint on every shell scheme stand. We also supply you with an easy-to-use exhibitor manual, free how to exhibit classes and personal service throughout. Exhibiting at Foodservice Australia is a great way to grow your business. For more information please click here or call Liz, Bryana, Eliza or Tim on 03 9999 5460. We are happy to run through the options and send you a detailed proposal.